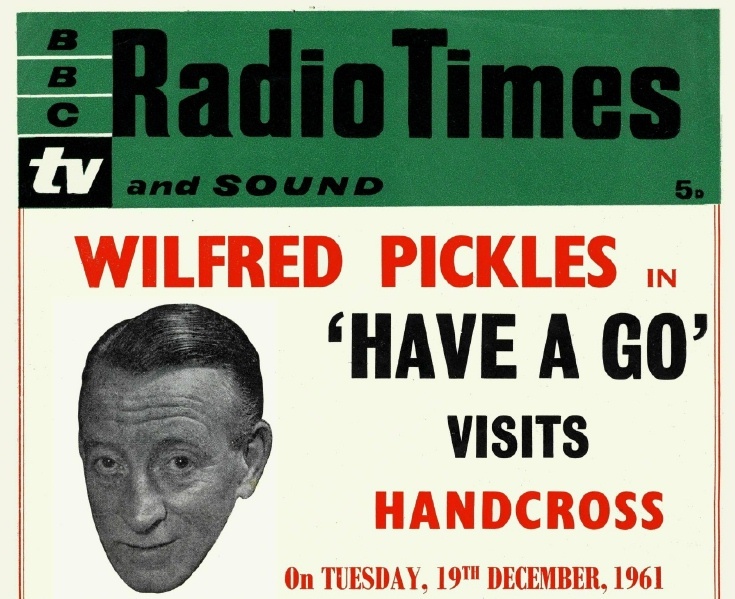 On 19th December 1961 Wilfred Pickles and his team came to the Parish Hall, Handcross to challenge the village to “Have a Go”. The show ran from 1946 to 1967 and attracted an almost unbelievable 20 million listeners in the early days. With the coming of television in many people’s homes the number had dropped to a more modest 8 million by 1961, but nevertheless still an amazing achievement by today’s standards. During the three days before the live broadcast, Wilfred (1904–1978) had based himself in the Red Lion, from where he conducted interviews to select certain members of the public to appear on the show. Over the next three days I shall upload various photographs, newspaper reports, and the actual BBC broadcast itself. The poster advertising the show can be seen by opening Large Version. Those lucky enough to obtain tickets found that they had to earn their supper by singing the opening and closing chorus. The lyrics were printed on the reverse of the tickets, although, as it was just a few days before Christmas, the closing chorus was changed to Good King Wenceslas! View the ticket by clicking on Open Document.